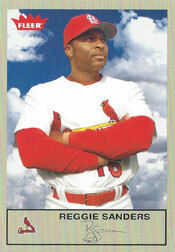 In a lineup of heralded run producers, including Albert Pujols, Jim Edmonds and Larry Walker, Reggie Sanders stole the spotlight with a standout RBI performance for the Cardinals in the 2005 National League Division Series. Sanders had 10 RBI in three games for the Cardinals in their series sweep of the Padres. Sanders, 37, established a NL Division Series record for most total RBI. Doing it in the minimum three games added to the awesomeness of the achievement. To put the feat into perspective, consider that when Pujols and David Freese each had nine RBI for the Cardinals in the 2011 NL Championship Series against the Brewers, each did so in six games. When Pujols had nine RBI for St. Louis in the 2004 NL Championship Series versus the Astros, he played seven games. Sanders had missed 54 games during the 2005 regular season after fracturing his right leg. In five previous NL Division Series, Sanders had produced five total RBI, including one in 14 at-bats for the Cardinals against the Dodgers in four games in 2004. Sanders was 2-for-4 with six RBI and a run scored in an 8-5 Cardinals victory on Oct. 4 at St. Louis. In the third inning, the Cardinals led, 2-0. With the bases loaded and one out, Sanders, facing starter Jake Peavy, singled off the glove of first baseman Mark Sweeney, scoring Edmonds and Pujols. The grand slam was the third by a Cardinals batter in a postseason game. The others: Ken Boyer in the 1964 World Series against the Yankees and Gary Gaetti in the 1996 NL Championship Series versus the Braves. Sanders was 1-for-4 with two RBI in the Cardinals’ 6-2 victory on Oct. 6 at St. Louis. The Cardinals completed the sweep with a 7-4 victory at San Diego. Sanders was 1-for-4 with two RBI. For the series, Sanders batted .333 (4-for-12) with two doubles, a home run, a single, a walk and a run scored.